Is there anything more delicious than a really juicy story? Tohko Amano, self-styled “Book Girl,” doesn’t think so. And to indulge her passion for delicious snacks, she’s grabbed underclassman Konoha Ionue to write for her. Indulge she does, as she *actually* eats what she reads. As a member of the Book Club, Konoha rapidly becomes used to Tohko’s idiosyncracies, foibles, habits and other words that mean “Tohko’s a strange bird.” But Konoha was totally unprepared to find himself writing love letters for a first-year student… or to find that the recipient of these love letters doesn’t actually exist. 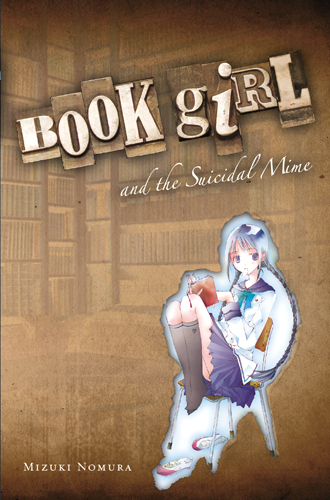 Book Girl and the Suicidal Mime is a series of slightly too many plot twists strung together like beads, to form a complete, eccentric whole. Sketch-like illustrations add to the atmosphere of reading one of Konoha’s handwritten “snack” stories. Fans of the Suzumiya Haruhi novel series are likely to find the combination of Konoha’s sarcastic, not-quite-milquetoast personality and Tohko’s overbearing weirdness (and the subtle tension between them) to be a familiar – and entertaining – formula. Fans of books about books, such as the Dante Club, or Name of The Rose and fans of the ROD series are also likely to find this series worth a read. As a fan of all of the above, I personally found the novel engaging from the first word to the last – something I can honestly say about very, very few light novels – heck about very few *anything* these days. The subject matter, as the title suggests, is grim in places, but I can’t think of too many teens for whom this would be a traumatic read… and the subtext of the story is about redemption and being weird yet functional, in a totally honest-to-yourself way. Although the age rating is 15+ because of the subject of suicide, I myself would have enjoyed it at a much earlier age. Yen Press has given this series a fetching YA-novel look, and without the baggage of an a priori anime or manga fandom, this series has a good chance of just being appreciated for what it is – good teen lit. I’d recommend this book highly to any book-y teen or precocious pre-teen or any adult that isn’t turned off by the idea of reading teen lit. Bottom line – I enjoyed the heck out of this book and eagerly await the next one in the series. You are currently browsing the The Manga Curmudgeon blog archives for the day Wednesday, July 28th, 2010.